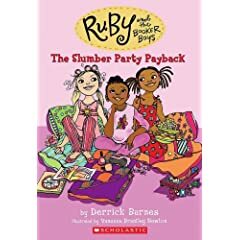 Derrick Barnes has written several books on parenting, including The Ruby & the Booker Boys series — Book one: Brand New School, Brand New School, Book two: Trivia Queen Third Grade Supreme, Book three: The Slumber Party Payback. I always hope to accomplish two primary things with my characters and stories: 1) Give birth to positive characters that may not be in existence or properly represented in children’s literature. 2) Weave together the kind of tales that children can relate to and introduce topics that haven’t been tackled yet. I try to add a touch of flavor, a different perspective, to issues that are important to parents and kids alike. Coming from a single parent household, without a dad in the home, and amazingly becoming the dad of three beautiful boys, I’ve learned a few things. Most importantly, in regards to their development, I understand that I am their first example of what a man should eventually become. They pay attention to everything I do, how I talk, how I love and respect their mother, handle business, make decisions—everything. I am constantly mindful of that fact, and I relish the responsibility. I love those little guys so very much. Dads need to offer safety, be instrumental in the social and intellectual development of their children, and most of all, provide discipline, discipline, discipline. I’m old school, what can I say? Being too “chummy” and not being a good listener. I think it’s okay if your kids think you’re cool and like spending time with you, but there has to be a very strong line drawn so that the level of respect that a father needs from his children is not blurred. You can’t be the bearer of life lessons and wisdom if your children don’t respect you. At the same time, I think a dad has to always make himself available to talk. They may be little people but what they think and feel is so important and it means a lot that we take the time out to conversely give them the care and respect that they deserve. I think that it’s so true. We go so hard with our careers. We have the mindset that we’re doing it for our families, especially the dads that are the main breadwinners. It’s understandable. But when it’s all said and done, just spending quality time with your kids is far more valuable than those overtime hours. The experiences, the conversations, and the laughs are all moments in a child’s life that they’ll always cherish. I don’t think so. More than anything, I think kids need to be made aware of the fact that they are extremely blessed and that there are children in the world that may not be as fortunate as they are. I think we should give our children compassion for others, and gradually talk to them about some of the harsh realities that we all eventually face. They need to be given some source of spirituality to help them deal with adversities that are inevitable. That’s a dad’s job. Maybe not smothered, but maybe well doused with a drenching of positive reinforcement, admiration, and love. They’re going to be presented with so many people as they mature, and not everyone will have their best interests at heart. But if they leave the gate with a strong sense of self, balanced with self respect for others they will be ready for the world.